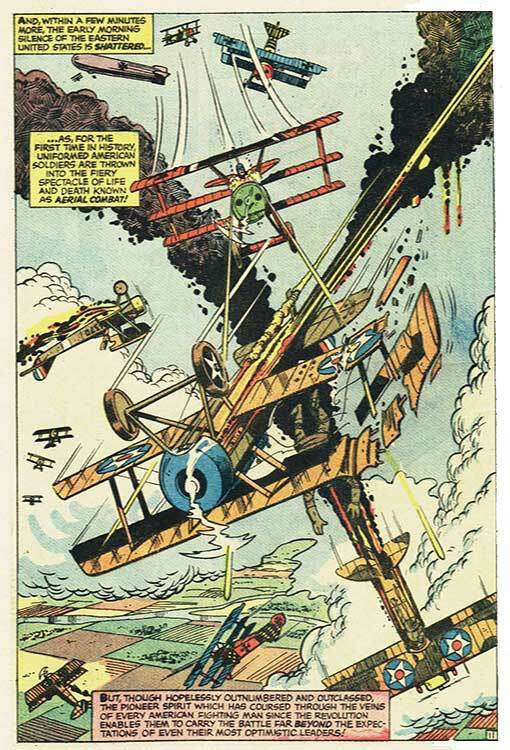 ...in 1917, German-American aviator Karl Kaufman knows it's only a matter of time until America enters World War I on the side of the Allies. Unfortunately, after he moved out of the family home, his homesick parents had returned to Germany before the war began. 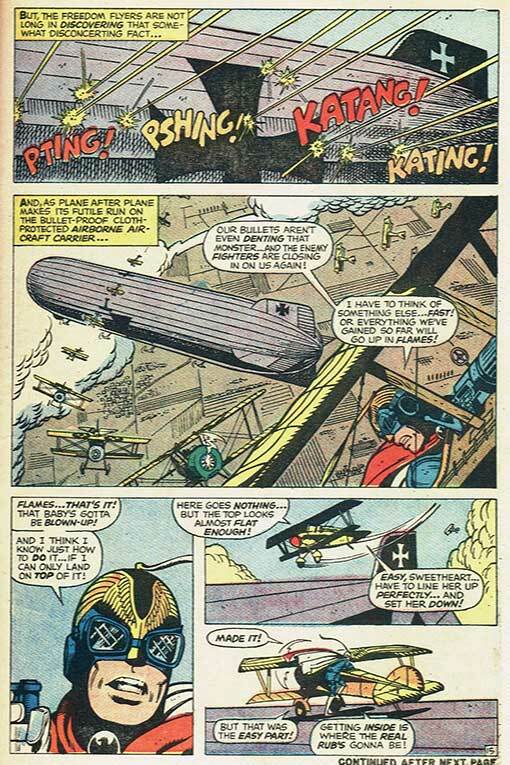 Karl believed that, if he fought for the Allies (as many American flyers had in the Lafayette Escadrille), his parents might suffer reprisal. 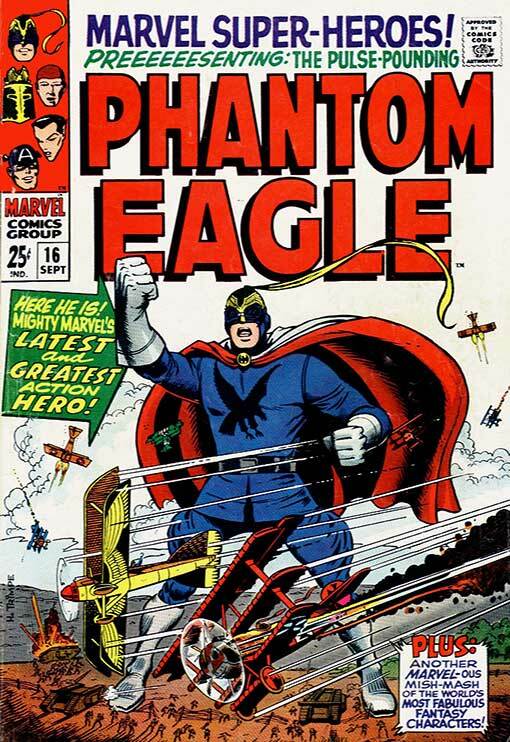 So he adapts the identity of the masked Phantom Eagle. 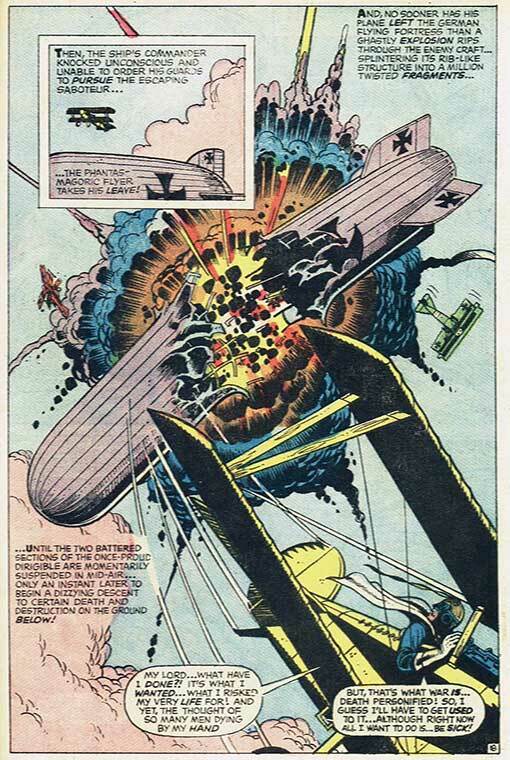 While testing his aircraft over Long Island Sound in anticipation of going to Europe, he encounters...a flight of German Fokker fighters! 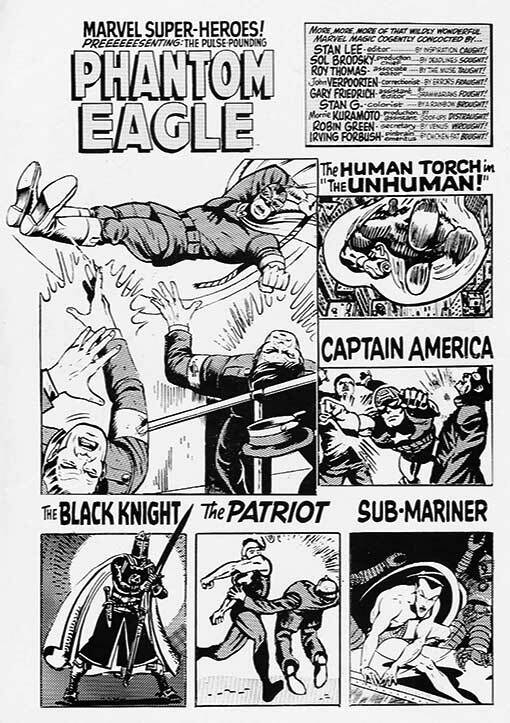 Taking down three of them, the Phantom Eagle follows the rest of them to their nearby base...a gigantic dirigible aircraft carrier hanging in the clouds over America's East Coast! 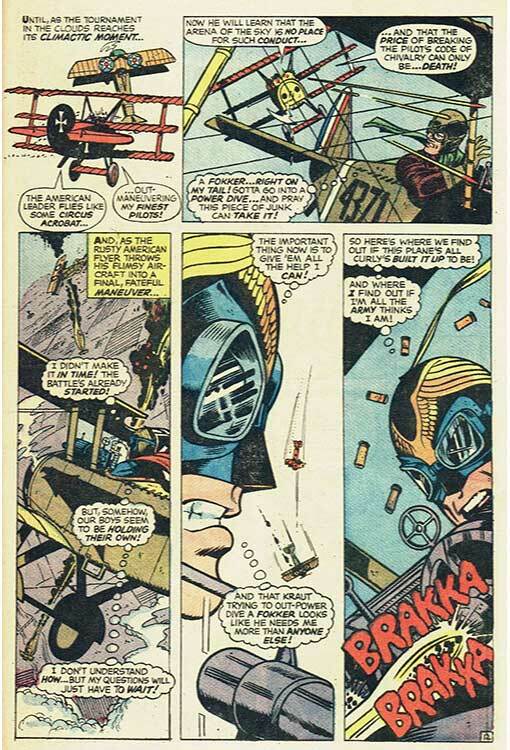 Without a radio, the Eagle chooses to retreat back to his airfield so he can phone a nearby Army Air Corps base and refuel/re-arm his custom-built fighter. 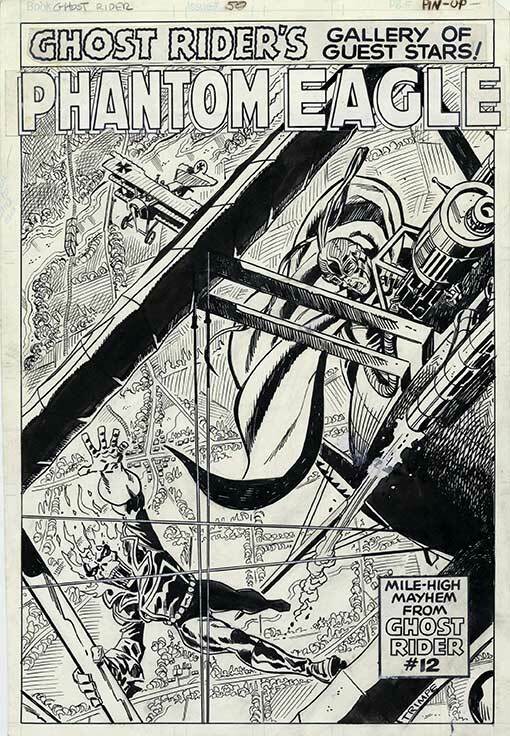 Though it appeared in 1968, after a number of Trimpe pencil and/or inking assignments had seen publication, this was Herb's first submission to Marvel while he was working in their Bullpen! Herb tells the tale in this interview! 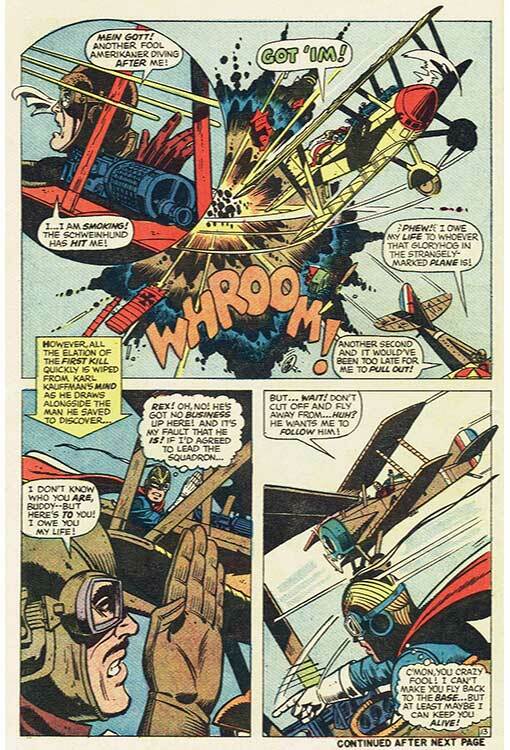 Historical note: When Trimpe (and Gary Friedrich) came up with the character in 1966, the 50th Anniversary of World War I was ongoing, and several comics publishers had premiered WWI-themed strips and comic books, including Dell's World War Stories, G-8 and His Battle Aces (which you'll see here in August), Lawrence (a one-shot based on the movie Lawrence of Arabia), and Air War Stories; DC's Balloon Buster (in All-American Men of War, Our Fighting Forces, and Enemy Ace (in Our Army at War, Showcase, and Star-Spangled War Stories). 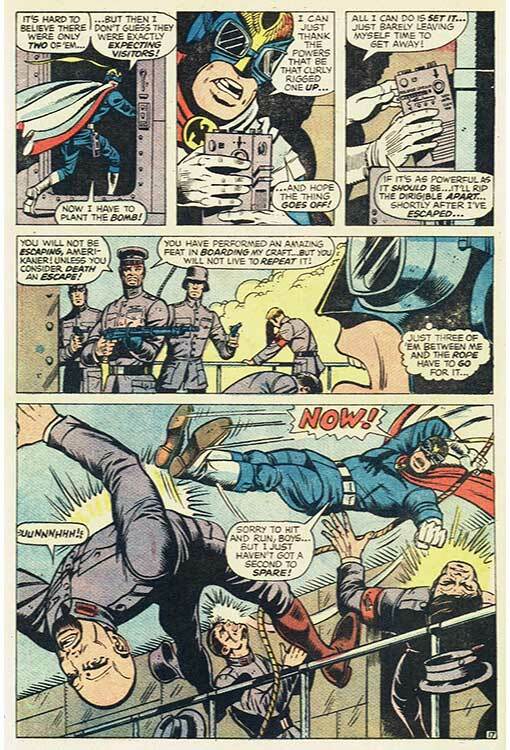 Marvel was limited by newsstand distributor contract to how many books they could publish per month, and decided not to cancel/revamp any existing titles. 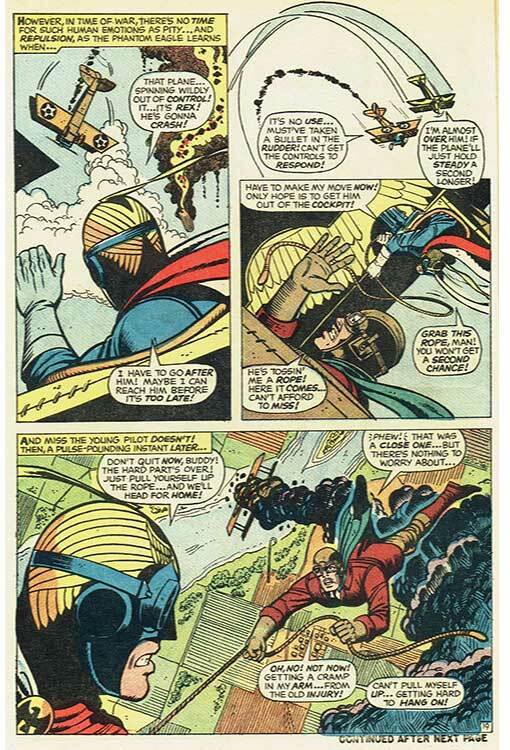 In 1967, Marvel took the reprint title Fantasy Masterpieces, which went from 1950s Atlas sci-fi stories to a mix of those tales plus 1940s-50s superhero stories, retitled it Marvel Super-Heroes, and dumped the sci-fi, replacing it with super-hero tryouts to "test the waters". 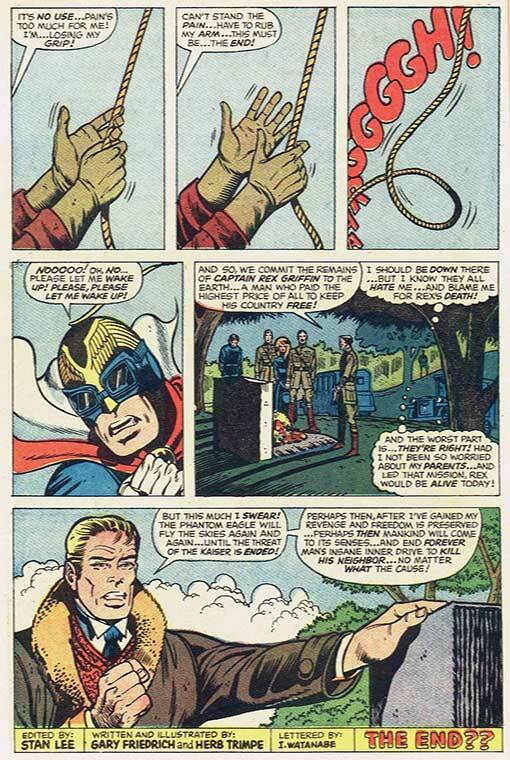 The first one, Captain Marvel (Captain Mar-Vell), was an immediate success. 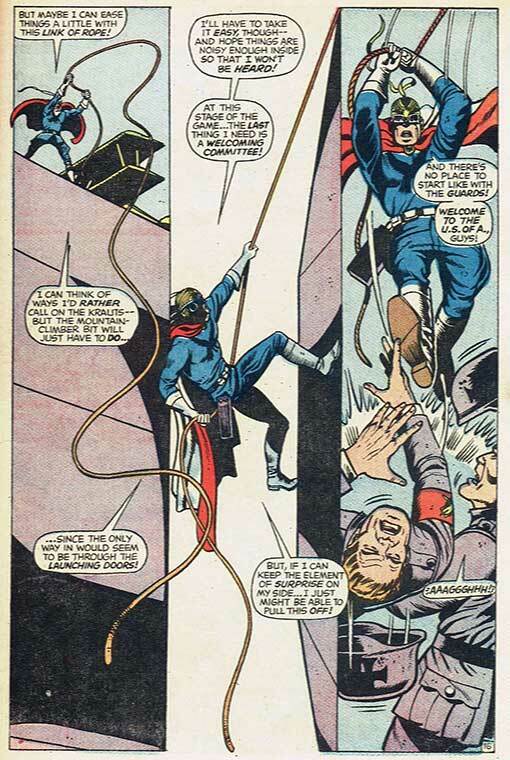 Black Knight, Ka-Zar, Medusa, and Doctor Doom, showcased supporting characters and ended up as springboards to later appearances by the characters in other books and (except for Medusa) eventually, their own strips and/or titles. Well, we know what happened to Guardians of the Galaxy, which, after receiving an All-New X-Men-style revamping, went on to multi-media glory. 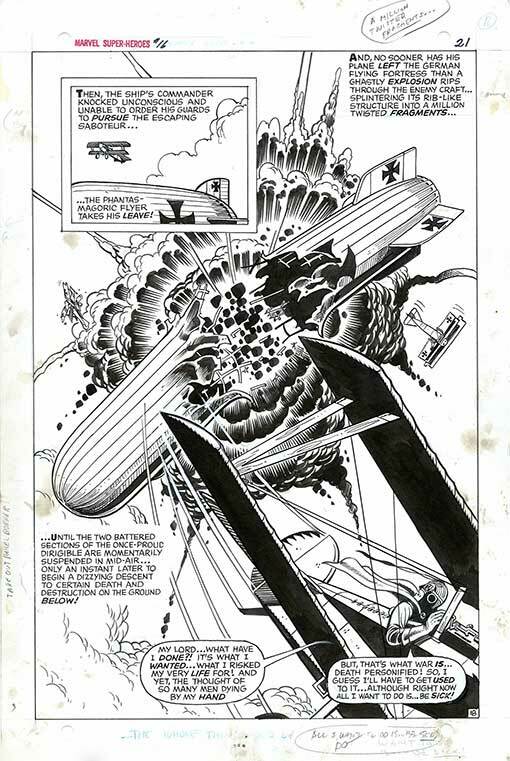 ..and, finally, 40 years after his debut, his own book, a 2008 mini-series entitled War is Hell: the First Flight of the Phantom Eagle by Howard Chaykin, who had previously-deconstructed DC's premier aviator, Blackhawk! 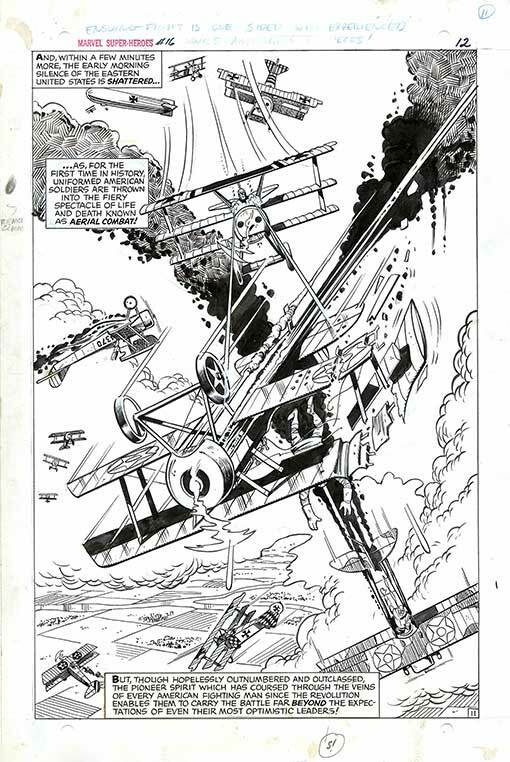 Bonus: original art of several of the pages seen above. 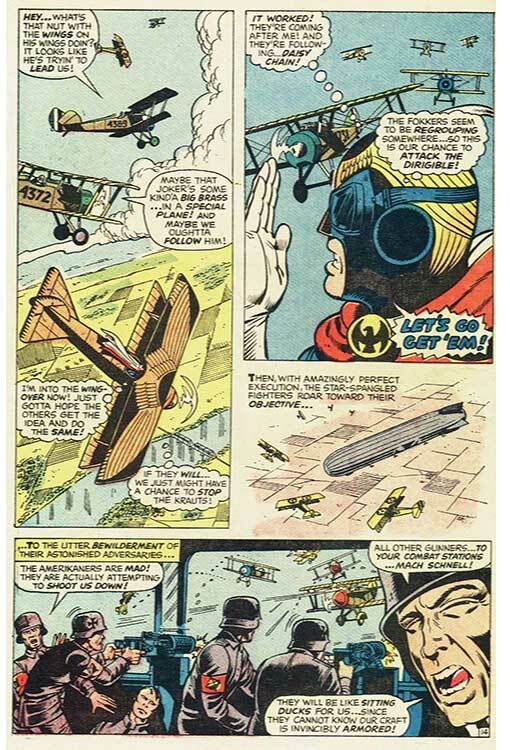 Next Month: G-8 and His Battle Aces! Reading Room: WOLFF "Manuscript of Rep-Tah"